Can Solé Xic is an small restaurant located in Claret ‘s main square. We have 3 small dining rooms suitable for groups and events. Its capacity is for 12, 16 and 25 people. We can also served small groups . Our à la carte menú consists of typical dishes that they are always available . 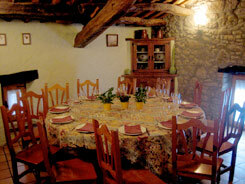 For the starters we offer the Cataln country style meat and vegetable soup andthe canelloni. For the main courses grilled meats or pig’s trotters with plums and pine nuts and for desserts catalan caramelized custard cream. Among other seasonal dishes, mediterranean cuisine and creative cooking such as the courgettes puff pastry with salt cod brandade, wild mushrooms sauce, calf’s cheeks with red wine with Lleida pears and cheese mousse with red fruits. The restaurant is opened on Saturdays and Sundays and all holidays from half past one to 4 pm. Ckeck availability for any other day and times.